Doctor Who: The Prehistory Of Kroll | Warped Factor - Words in the Key of Geek. While Doctor Who has indeed tackled the prehistoric age - see An Unearthly Child and Ghost Light for but two examples of how early man has been presented to his modern day successors - another spin on a familiar trope was attempted just four regenerations on from that first trip to the Stone Age. Only this time the "primitives" were green & worshipped a giant squid as their god, not far off Kal & Za's fervent battle to find favour with Orb, or as we now call it, the Sun. Welcome, then, to a sideways but entirely logical new light waiting to be shed on The Power Of Kroll! Tensions aplenty are visable between the human staff of a chemical refinery and the more nature-loving humanoids the Earth Empire shifted to the marshland moon of Delta Magna in the first place, as they battle to preserve their way of life in the face of opposition from modernity. And while they're a literate bunch they just can't resist clinging on to some of the old ways. Witness the almost- sacrifice of Romana. SWAMPIES: Kroll! Kroll! Kroll! Kroll! Kroll! Kroll! Kroll! RANQUIN: All is ready in the Temple of Kroll. SKART: The offering is prepared. SWAMPIES: Kroll! Kroll! Kroll! Kroll! VARLIK: Soon we will put a stop to that. RANQUIN: Open the pit! Let Kroll come from the bottomless deep! Kroll, hear thy people. RANQUIN: Kroll, we summon thee! RANQUIN: Kroll, we offer this life in tribute to thy greatness. RANQUIN: Guide and protect us, All Powerful One, in the great struggle which lies ahead. SWAMPIES: Kroll! Kroll! Kroll! Kroll! Kroll! A potted history of sorts is provided for the benefit of the Doctor, separated from his handler/companion during this quest for the Key To Time and taken back to the refinery. Swampie servant Mensch, who's treated like dirt by the humans, knows exactly what's going on. MENSCH: My people are calling Kroll. They're making a blood sacrifice. THAWN: Oh, it's their name for a giant squid. Centuries ago, when we resettled the Swampies from Delta Magna, we shipped along a couple of specimens just to keep them happy. DOCTOR: Yes, but just the same, a blood sacrifice. I don't like the sound of that. THAWN: Don't be stupid. You'll never cross those swamps on your own. DOCTOR: What? Look, I have a shrewd idea who it is that might be being sacrificed, and Romana's not the easiest of guests. The essay Politics In A Blue Police Box also points to an imperialist subtext running throughout, too. "Another excellent example of the show’s reflection of the political climate is in the adventures which feature colonialism as a main theme. Since Britain was at one point in time the largest imperial power on Earth it makes sense that a good deal of the classic adventures, some of which were written during Britain’s period of decolonization, deal with this subject. In Lindy Orthia’s article “‘Sociopathetic Abscess’ or ‘Yawning Chasm’? The Absent Postcolonial Transition in Doctor Who,” (2010) Doctor Who has discussed anti-colonialist subject matter rather regularly during its duration, beginning in its initial season and enduring into the revived show. Six adventures present colonial conditions in calamity: “The Sensorites” (1964), “The Space Museum” (1965), “The Mutants” (1972), “The Power of Kroll” (1978), “Kinda” (1982) and “Planet of the Ood” (2008)." All a world away from an earlier light hearted tootle on an improvised reed flute, showing off an excellent grasp of Bach. The Fourth Doctor had perhaps the best track record when it came to lowering supposed gods from their perches, having deduced that the likes of Sutekh and Mandragora were in reality nothing of the sort even in the face of whole cults devoted to them, in a sense making this familiar territory. Lest we forget Xoanon, the computer with a god complex, into the bargain! Surely your faith would be crushed if the god you devoted so much to turned out not to care who it got rid of when it launched an attack on what it presumably saw as the greatest threat to its power? No such trouble for Kroll, who drags the servile Ranquin to his death anyway even after all that loyal service. "Master, hear thy servant Ranquin. Great Kroll, defender and saviour of the People of the Lakes, let not thy wrath fall upon thy true servants. Great One, we ask only that the dryfoots and their abominations be crushed by thy mighty power! Master, this is thy servant!" How the squid got so big and came to be taken for a deity will be explained in good time by the Key to it, the once normal-sized Kroll rendered rather larger after swallowing an earlier Swampie high priest and his sacred relic. Which is actually a segment of the Key itself! ROMANA: How did you know that the fifth segment was a part of Kroll? DOCTOR: Well, it all added up. I mean, the obvious disguise for the segment was the Symbol of Power, and that wasn't around any more. ROMANA: Ah, yes, because according to the old book in the temple, Kroll had swallowed it. DOCTOR: That's right, along with the High Priest. Of course, it wasn't so big in those days. Kroll, I mean. Just an ordinary giant squid. 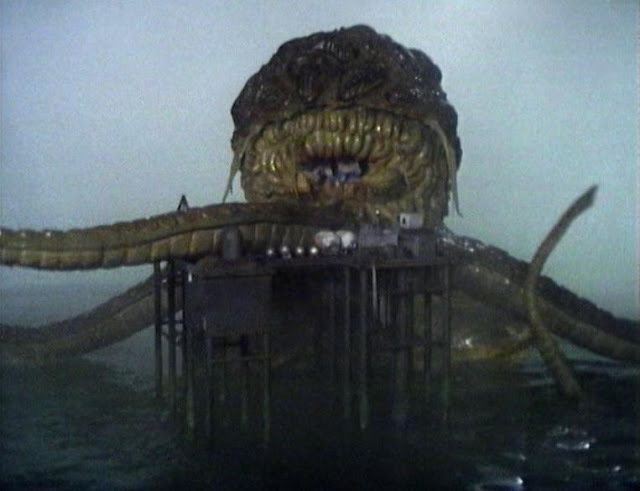 Leaving the Doctor & Romana to take the segment, return Kroll to its normal size and leave lots more nice squid in their wake. Tasty. And the White Guardian will be most pleased. Even better. For yes indeed, Kroll's guffs are the source of the refinery's prized methane....which could lead some to believe that his tale of having a Series One story idea featuring the return of the flatulent seabed botherer rejected as recounted in the introduction to the reissue of his coincidentally prehistoric novel Only Human may well have been a joke. "Before Russell T. Davies came along, there wasn't much of a Doctor Who industry, just a specialist niche occupying small corners of the internet and a few shelves in Forbidden Planet. 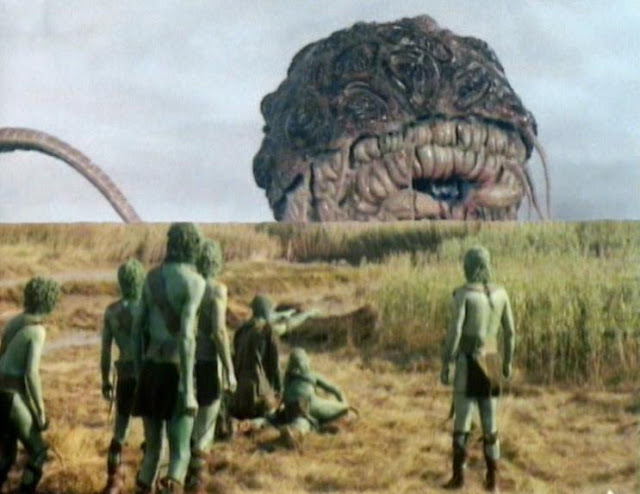 But since 2005, the series has become one of the BBC's biggest money-spinners, a sprawling beast that, like the thing Tom Baker battled in The Power of Kroll (episode 105), has many tentacles."